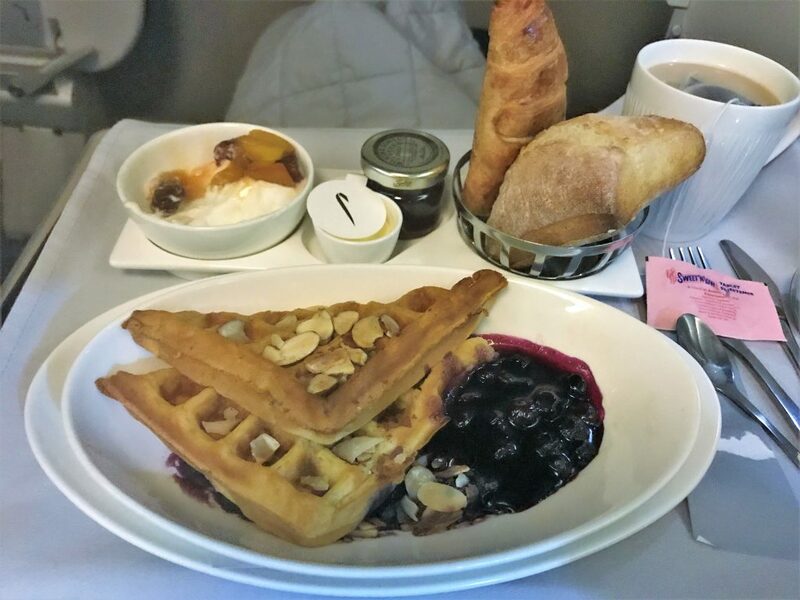 There have been quite a few reports recently of how the new Club World food on most routes is not at the same standard as the new Club World launch route of New York JFK. This is because New York has for a long time had different caterers – Do & Co. 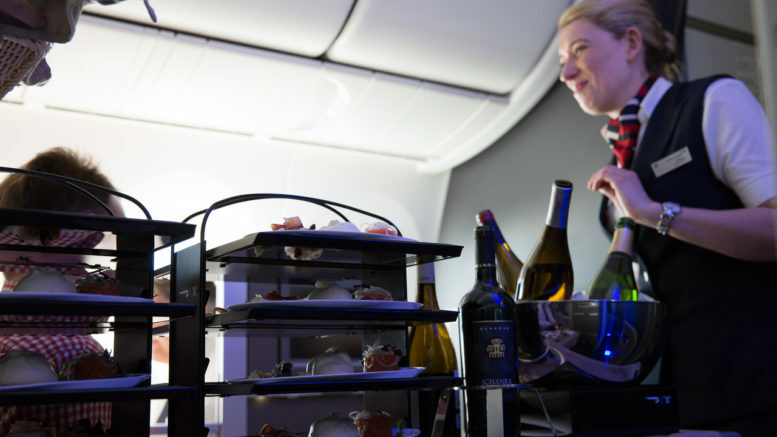 They have always provided a slightly more premium product for one of BA’s most important routes. There have also been a number of changes from the original service since I first tried it. I was sitting on the upper deck which I have found usually means a reasonably quick service even with the new Club World routine. 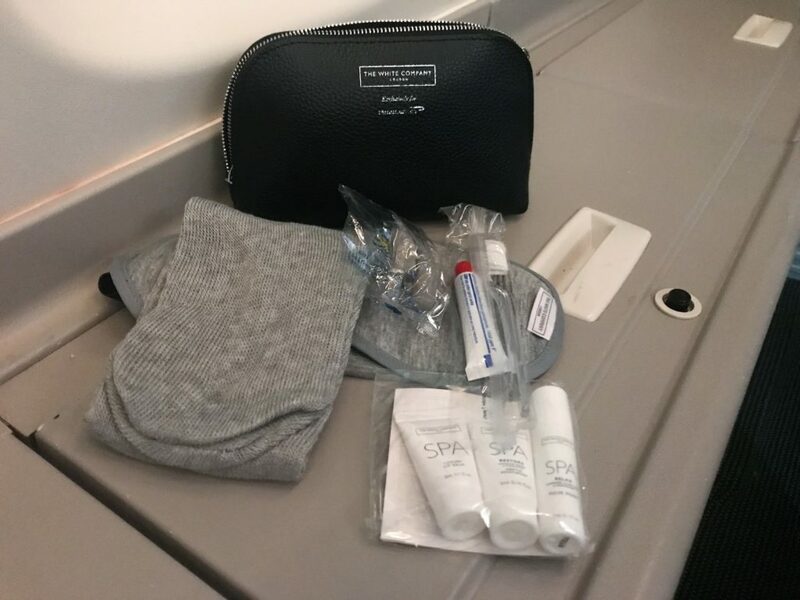 I was presented with the menu and the same White Company amenity kit as usual. I was also handed a bottle of water before take-off which I prefer to waiting until after the meal. I was then offered a pre-take off glass of Champagne or water in the new stemless flutes which look very elegant. I stupidly chose the Champagne and then regretted it after the wonderful Champagne I had been drinking in the Cathay and BA First lounges! 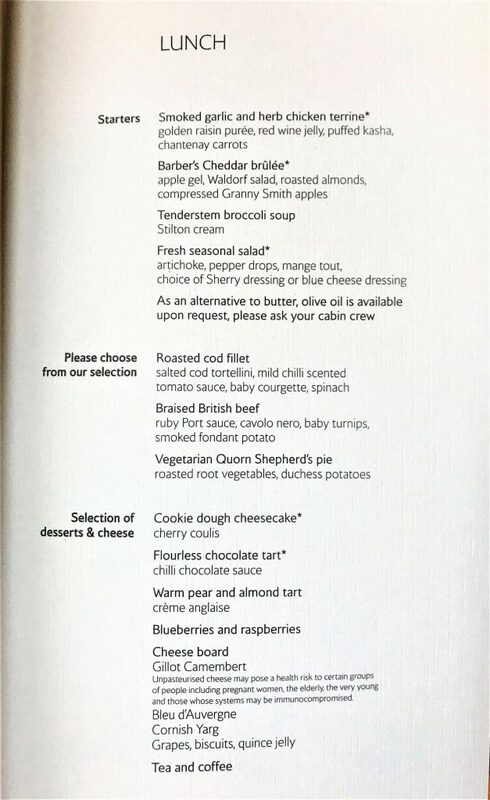 Since I last flew the colour scheme associated with the new service has changed from a beige colour to a more traditional BA blue which you could see immediately with the menu. 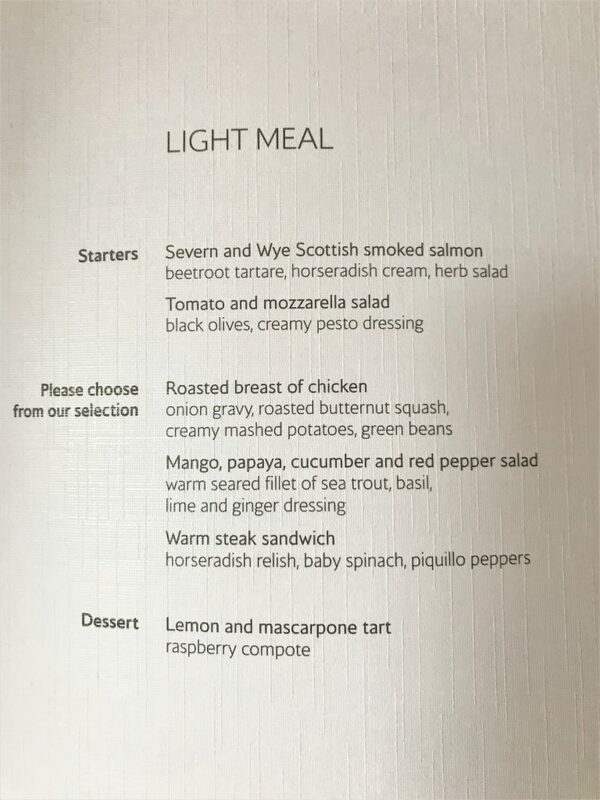 The menu had the same format as my previous flights with a larger choice of starters and desserts but only 3 main courses. This seems to be fairly consistently beef, fish and a vegetarian option which is often pasta. I have to say I would rather they reduced the number of dessert options and increased the main courses. 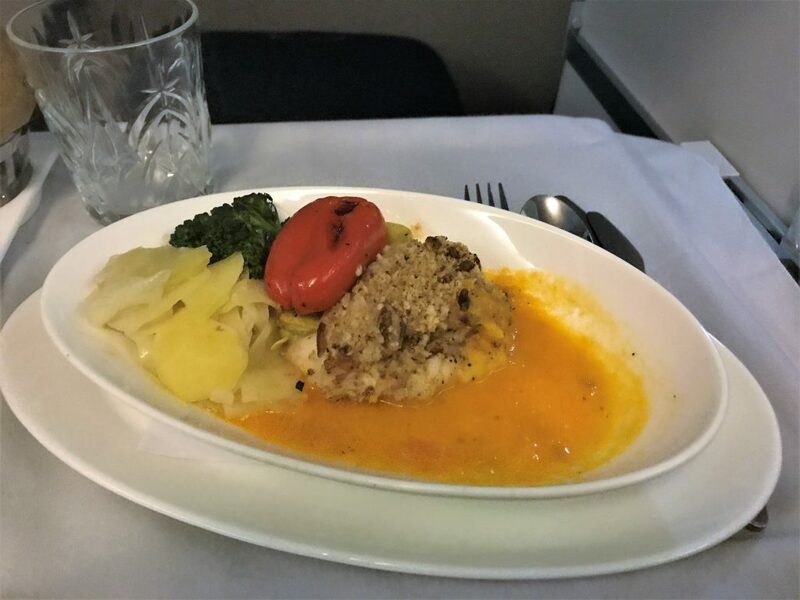 I am not usually a huge fan of fish meals on aircraft and don’t want to eat beef every time so that only leaves the vegi option. I think 5 desserts is way too much choice! Prior to the meal service I was offered a drink from the bar which was delivered by hand with some new style mixed nuts. I really enjoyed these nuts as they had a lovely crunchy flavoured coating to them. Much better than the plain nuts in my opinion. Having already indulged in plenty of Laurent-Perrier Grand Siecle in the Galleries First lounge during its brief appearance last week, I decided to go for wine. 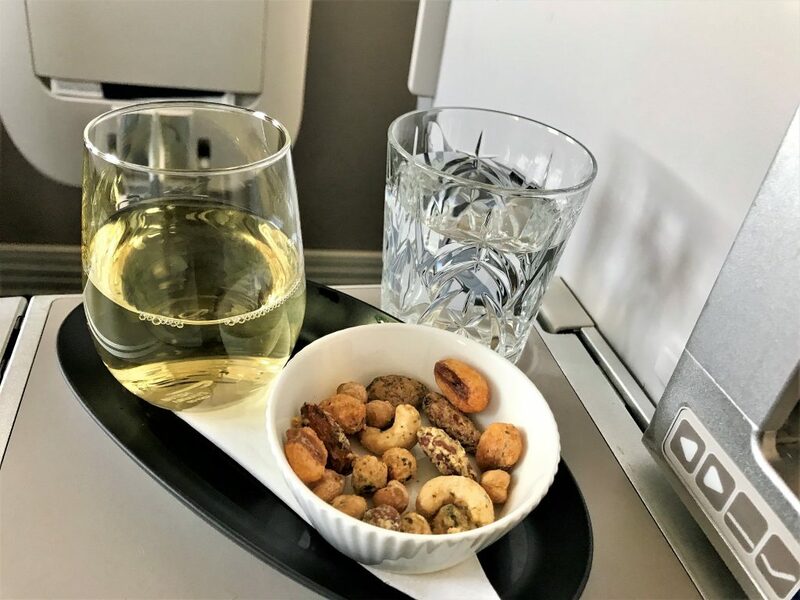 I had the Bourgogne Chardonnay which was a typical BA business class wine nowadays – perfectly drinkable but nothing to get excited about. The drinks are still being served on the rather naff looking black plastic trays. BA had to introduce these instead of the planned china ones so that drinks wouldn’t slide around as they were being served. I do prefer the stemless glasses from a practicality point of view although I know there will be some oenophile purists reading this that will disagree! For starter, I chose the chicken terrine. I could have also had a salad or soup as well if I wanted but since I had a snack in the Cathay lounge I wasn’t too hungry. When the tray was brought over, the first thing I noticed was there were several changes from the initial service. Firstly as I previously reported, the bread selection is now back to the usual bread with 2 different pieces (no choice) put into your bowl prior to service. One was, fortunately, my favourite garlic focaccia type bread and the other some sort of whole grain roll. I don’t actually mind losing the 3 in 1 roll they started with as although the bread was very tasty, it wasn’t any better than what I was served on this flight. The tray now only came with butter although you can still request olive oil too. The tablecloth was also a light blue colour with a crisp white linen napkin which I much preferred to the previous rather odd beige colour. I know it is a minor thing but it just screams cheap to me! 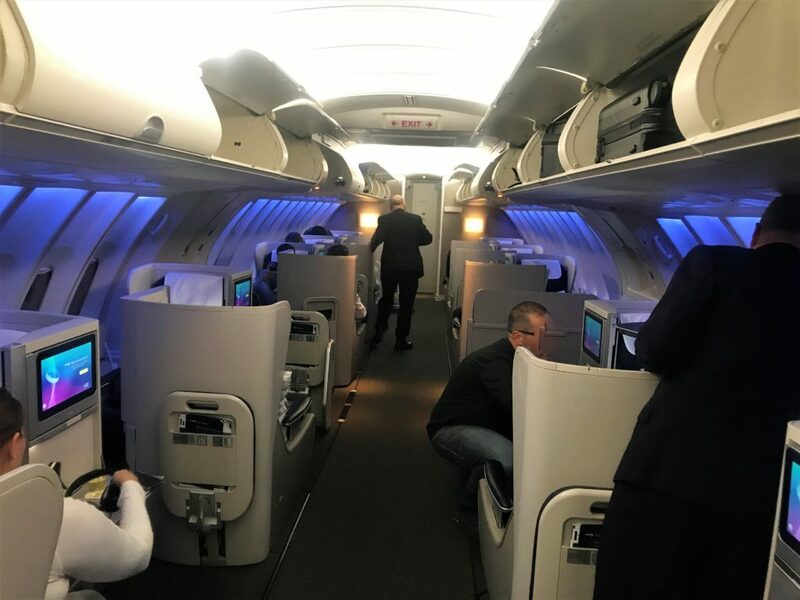 Given that we still have a year to wait until BA start rolling out their new Club World seats, it would be nice if they could keep the premium touches that other airlines have – even American Airlines has decent salt and pepper shakers! Fortunately, the food made up for the cutbacks in the service. I thought the starter was well presented and I would not have been disappointed to get served this in a restaurant. The terrine was not too firm like many are and had a lovely light smokiness too it. This contrasted well with the sweet accompaniments of the raisins, red wine jelly and tender roasted carrots. The dish was packed full of flavours and well-balanced. 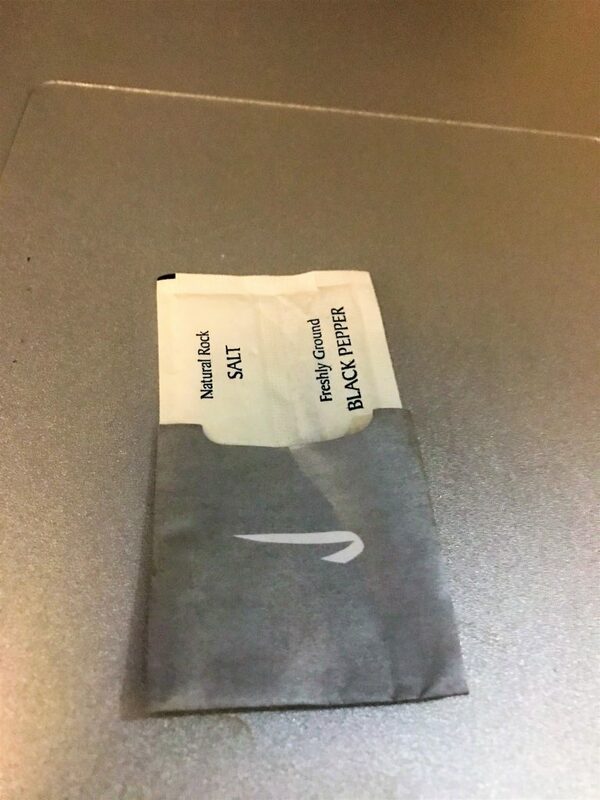 The service was excellent on this flight. The cabin crew member serving me was one of those crew that makes flying with BA a pleasure and that other airlines often fail to replicate. He was very attentive as I never had an empty glass plus he had the all-important personality with a bit of fun and banter too! I was torn between the beef and the fish for my main course as the beef was braised which suggested it would be tender. In the end, the fish won as it sounded a bit different. The presentation on this course was not great, particularly with the rather unattractive flaccid dark skin on the cod showing. Fortunately, it tasted a lot better than it looked. 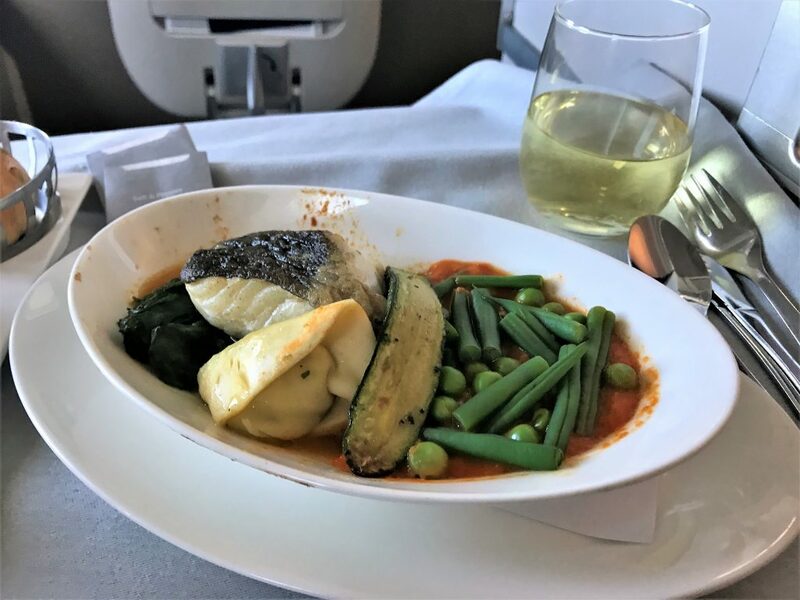 In fact, it was quite delicious and up there with some of the best fish dishes I have had on a plane in business class (lobster excluded!). The fish was still moist and the tortellini not dried out or overcooked either. The tomato sauce only had the lightest hint of chilli so didn’t overpower the more delicate elements. I would say this was a good as the Do & Co fish dish I had going to New York in December. There was a big choice for dessert and I was torn between the warm dessert and the chocolate cake. I went with the chocolate eventually. I am usually not big on chocolate desserts as I find them a bit rich but this was just right as it was quite small. The chocolate was dark which gave the perfect level of sweetness balanced with a little bitterness on the finish. It was slightly squidgy but not too dense. The chocolate chilli sauce didn’t taste much of chilli and I would have personally preferred a fruit sauce with a bit of acidity to balance out the chocolate more. Overall it was an enjoyable dessert. Unfortunately, I was still full from my lunch and Cathay lounge snack so I didn’t bother with it. There were some changes to the service from the initial launch which were evident but most of them were not a major issue. In fact, I actually preferred the new colour scheme and thought it looked more premium. The food was very close to being as good as Do & Co and there was little to fault. I think the D0 & Co was so good on the initial launch month, it would be hard to live up to it especially my favourite salmon with the wasabi sauce which was so delicious! 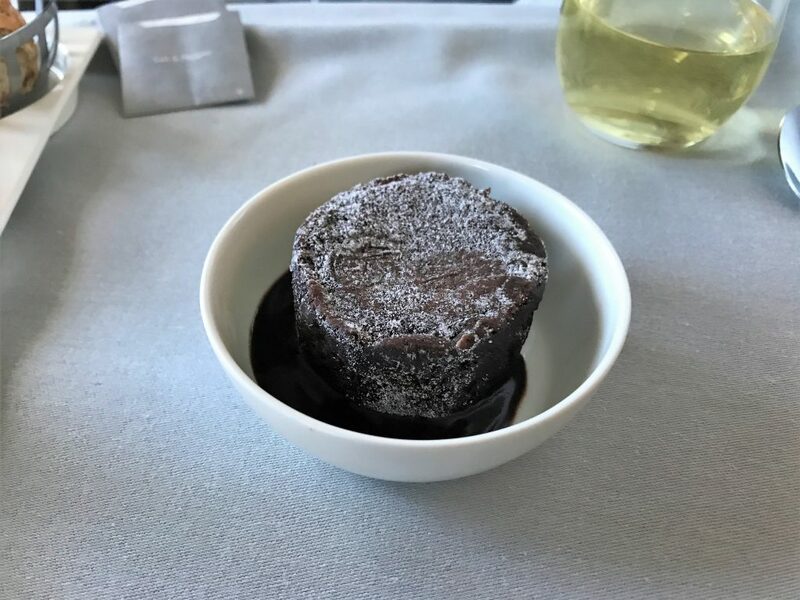 However, I would not say that there was a massive difference in quality between the two meals that I had and it is definitely an improvement from what BA were serving in Club World 18 months ago. 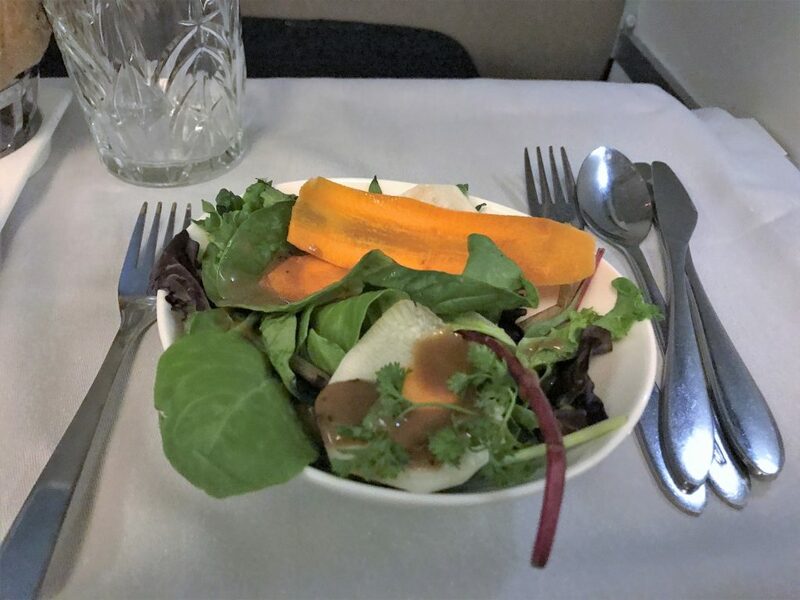 I hadn’t really eaten before getting on board so I decided to have a light meal after take-off before trying to get as much sleep as possible. 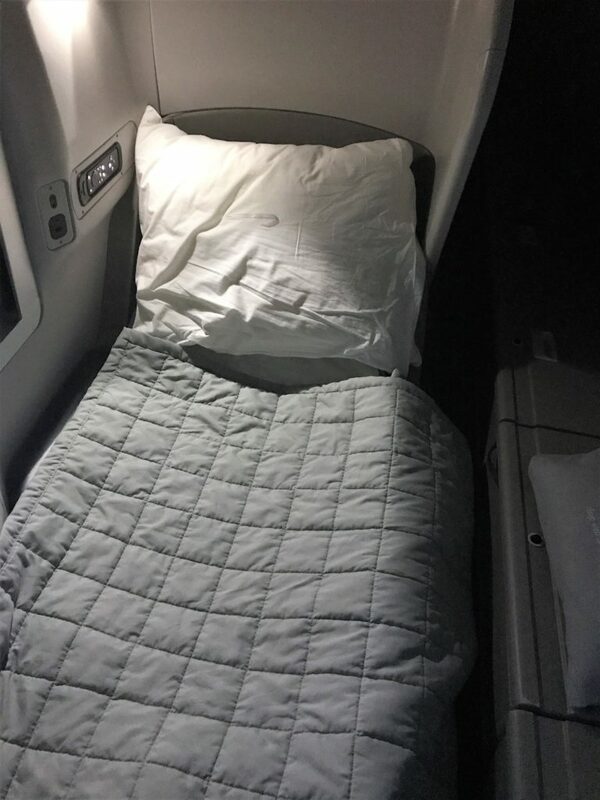 This flight also had the new bedding from the White Company which I really like, although the day pillow had gone which was a shame. Just after take-off an announcement was made that no one was to consume nuts on board as there was someone with a severe nut allergy on board. Whilst I have every sympathy for people with a medical condition I think this area needs to be looked at. This was a B747 and given that recent medical evidence says that nut allegries are not airbourne but are most likely to be brought on by touching a surface that previosuly had nuts on it, it seems over the top for an entire B747 plane not to be able to have nuts. It was made all the more farcical by the fact that two of the dishes they were serving in Club World contained nuts! So I was served my drink on its own without the tray or nuts after take-off. 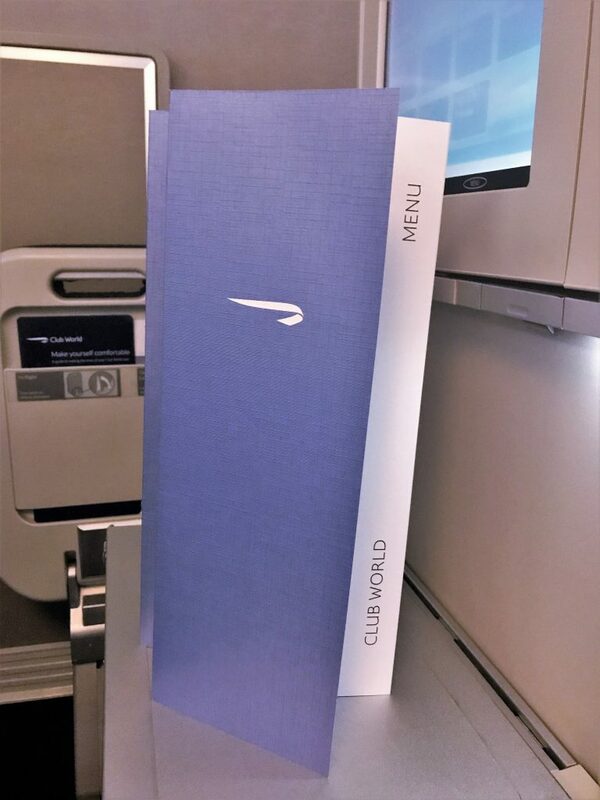 As usual, I had been presented the menu, bottle of water and amenity kit before take-off. 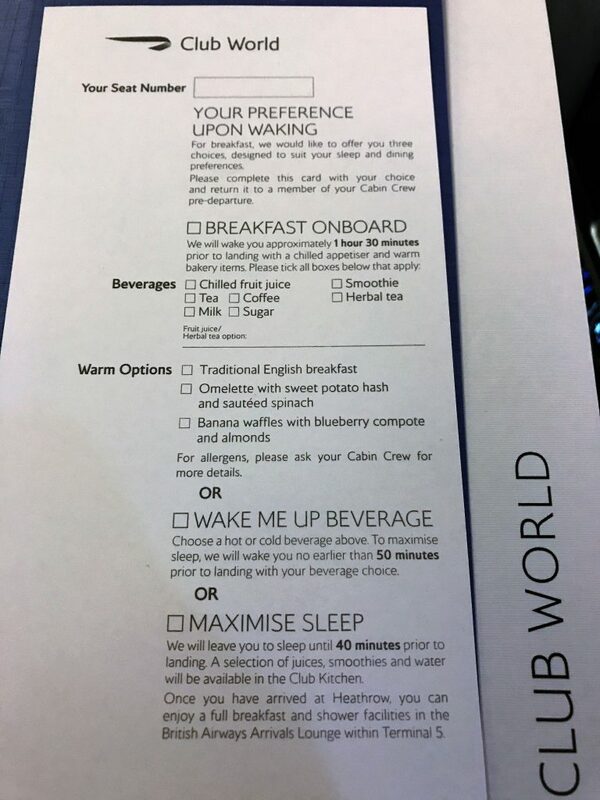 On night flights the menu has a breakfast card for filling in. I like this idea as it speeds up breakfast service and you don’t need to find the menu when you wake up and work out what you want. I didn’t fancy eating too much just before bed so I went for the lightest options – the salad and the haddock (with nuts!). The salad was fine although the carrots were quite hard to cut in the bowl but added a bit of interest. This time the tray came with butter and olive oil with my bread. The main course wasn’t quite as good as the way out which I often find the case on the US routes, but it was still enjoyable. The fish was nicely flaky as it was not overcooked and the sauce was light and tasty. I particularly enjoyed the potatoes with the caramelised onions which were delicious. I didn’t bother with anything else as I was keen to snuggle down in the White Company bedding which I really like. There was nowhere to select your choice of starter on the breakfast card as in fact, I got both. The tray was also served with a bread roll and a croissant in the bread basket. This seems quite wasteful to me as I doubt most people eat both so perhaps it should be a choice in the menu card? I really enjoyed the fruit which is so often hard and flavourless on aircraft. This was ripe and juicy so a refreshing start to my day. I also liked the yoghurt which had a lightly spiced fruit compote on top which made it a bit different from the usual berries. Next, I had chosen the waffles. They were meant to be banana flavour but I didn’t really get the taste of banana at all. However, like the starter, it was presented nicely and was delicious. I loved the plentiful blueberry compote which wasn’t too sweet. The waffles could have been a bit crisper but combined with the sauce and the slight crunch of the slivered almonds it was very tasty. This is probably the best breakfast I have had in Club so it was definitely a step up from the previous Club meals. I can’t really compare the breakfast as New York is a short flight time and the breakfast offering more limited. 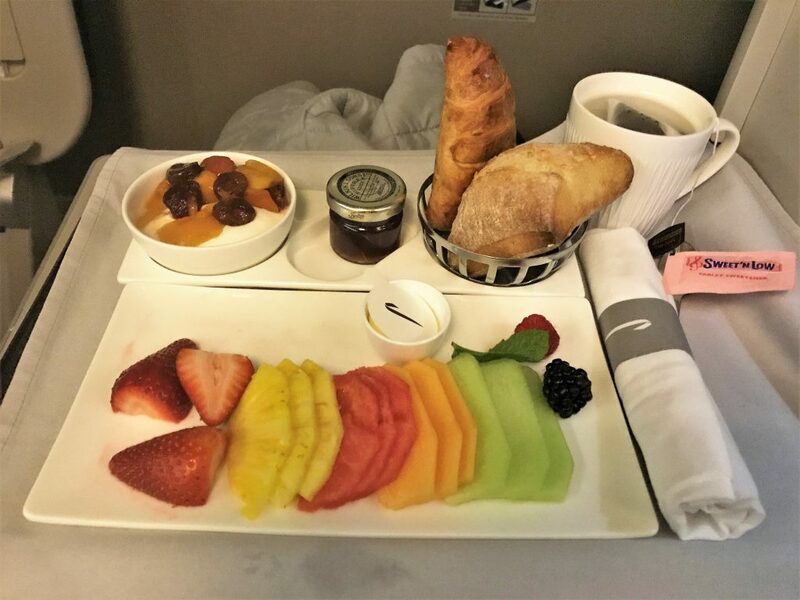 I was very impressed with this breakfast though and would probably choose to have breakfast on board more often. The fish main course was not as good as on the New York route but it was a step up from the old Club Catering. It was presented nicely, cooked well and very tasty for a light option. 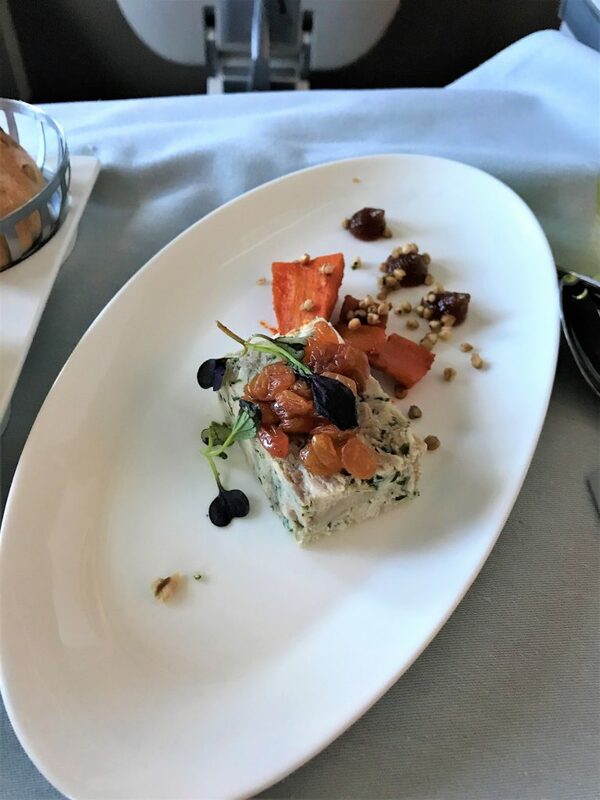 Overall there was a slight downgrade in the quality compared to JFK on the two flights but it was not anything that concerned me as all the food I had was good quality and a big improvement on the old days in Club. Presentation is vastly improved although I do wish they would do something about the salt and pepper (rant over)! 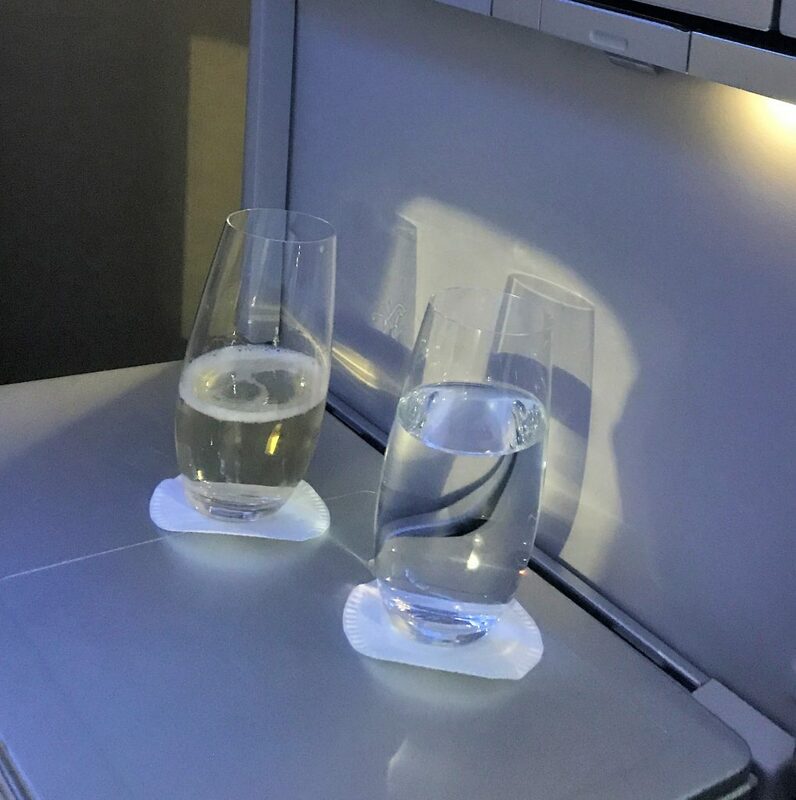 You can read all my BA and other airline business class reviews here. There is more information on new British Airways Club World food and bedding here. 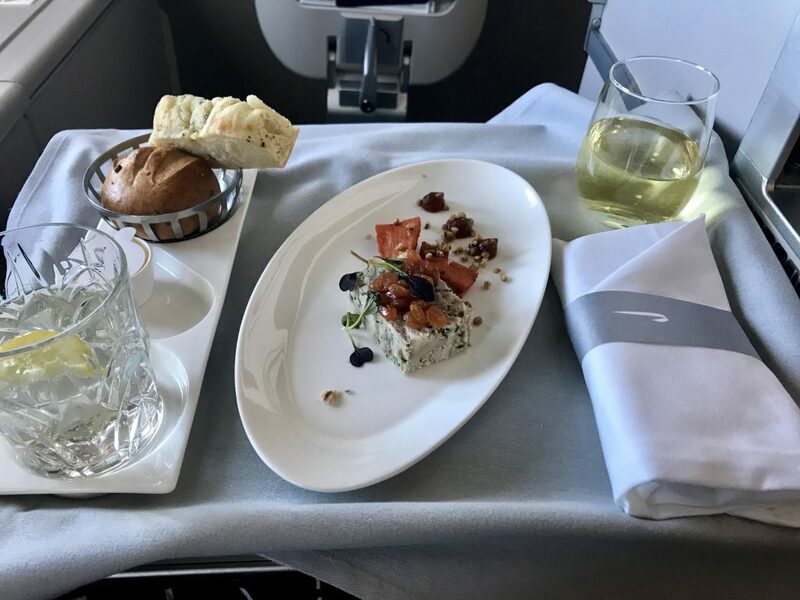 Be the first to comment on "British Airways new Club World food review: 7 months on – JFK vs new routes"